Arghhhhh!! Another week and another round of tabloid reporting stating it will snow in London. A new site called MyLondon based in Canary Wharf has been stating “London weather: Heavy snow is set to blanket the capital” and quoting the Met Office. 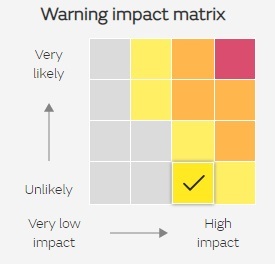 Yep, the bare minimum warning listed and a tick next to “unlikely”. Yet that transforms to sensationalist headlines in many local and national media outlets. And then what gets me is people blame the forecasters and Met Office rather than the press who take things WAY out of context. This doesn’t mean it won’t snow of course. It very well could but confidence is low right now – as it always is in the UK until 12-24 hours before given we live on an island surrounded by water at 10c. It’s a lot easier to be certain about snow on large landmasses such as the European continent over the Channel. And so the Met office will never state with certainty this far out what will happen. Keep that in mind as a plethora of press outlets go mad with headlines this week and throughout the year. Even if it does snow, it doesn’t make the reporting any better. Like a stopped clock, putting this up continuously means they will be correct once in a while but it’s lazy stuff. Many hacks love a good weather story. The Express is particularly guilty of the ‘Brrr! Britain Freezes!’ headline genre for some reason. The fact is, snow is a lot less prevalent than when I were a lad so people tend to get more excited about it — or the prospect of it — nowadays.